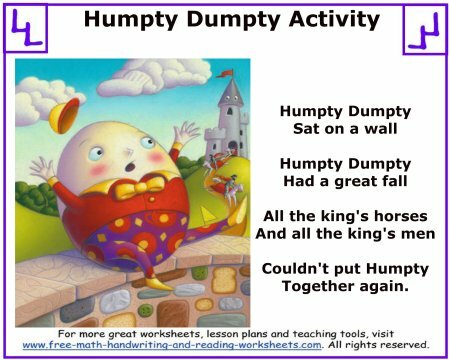 Everybody knows the Humpty Dumpty nursery rhyme, but did you know that it can be turned into an educational tool for building fine motor skills and ordering tasks? Below are two printable worksheets that do just that. The first handout shows students the nursery rhyme and has a picture alongside it. The second paper has the same picture, but it is out of order. Students will need to cut out the pieces (fine motor) and then glue them in the correct order. You may want to use another piece of construction paper to complete this task or you can have students glue the pieces onto the first worksheet. Grab your activity sheets here by clicking on an image. It will open in a new window and give you the option to print or download from Google Drive. 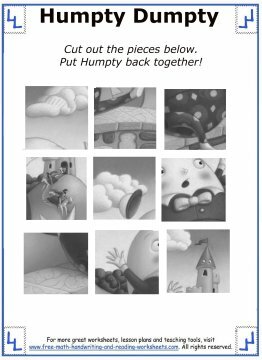 Find more nursery rhyme activities and fine motor tasks on the pages below.